UPM and Carbodeon developed products will be available both for Fused Granular Fabrication (FGF) and for Fused Filament Fabrication (FFF). 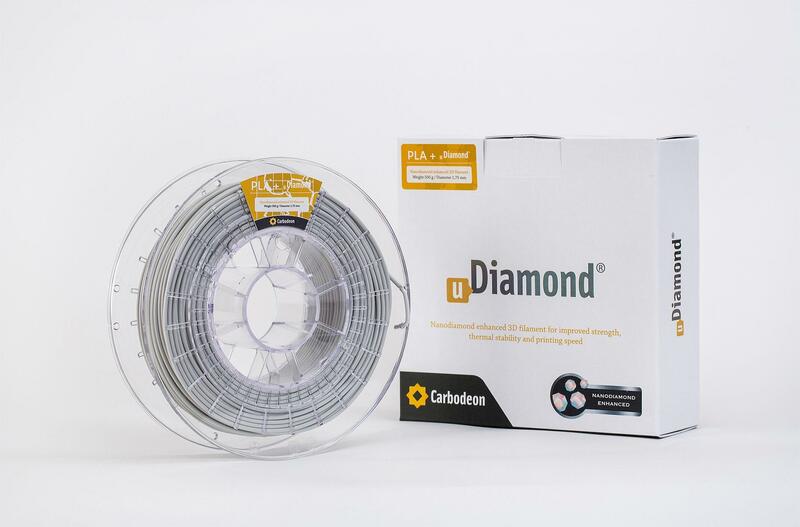 “By joining our forces we are able to combine the excellent mechanical properties and printing speed of nanodiamond enhanced 3D printing products to UPM cellulose based 3D printing raw materials”, says Carbodeon CEO Vesa Myllymäki. Nanodiamond additives provide the product not only improved stiffness and strength but also higher heat deflection temperature. In addition, the printing speed is significantly enhanced due to compound tailored thermal and flow properties. Fine cellulose fibres in turn brings self-supporting melt flow, enabling objects with round or other complex shapes to be printed without warpage problems. 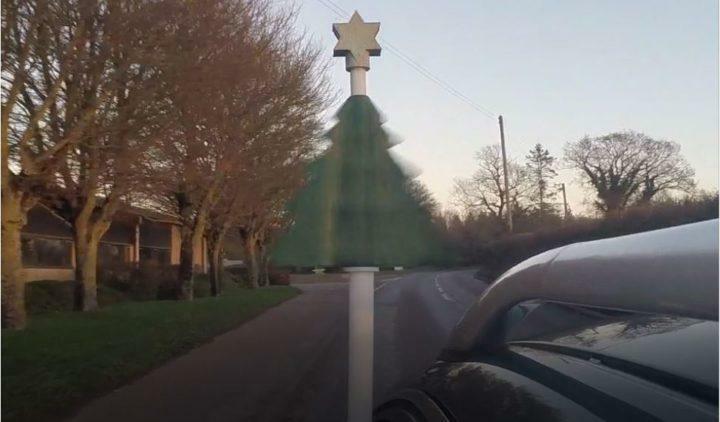 “Other benefit of cellulose biocomposite is its wood like post processing. Prints not only have pleasant matte surface touch and feel but 3D prints can be finalized by standard wood processing methods. Our aim is to bring sustainable biocomposite alternative to the field of technical polymers with short fibre filling. UPM Formi raw material grades are 100% recyclable and available with FSC® and PEFC™ certification”, says Eve Saarikoski, Application Manager UPM Biocomposites. By combining nanodiamond and cellulose fibre technologies together we can have natural fibre composite that has higher melt flow than of standard plastics. This opens new possibilities for tailoring the properties for 3D filaments and large scale granular based additive manufacturing. 3D materials market is estimated to be ~$5 billion by 2020 so we see huge potential here. The first UPM/Carbodeon 3D products will be PLA (polylactic acid) based, with possible further developments on other thermoplastic materials. “Product development partnerships with innovative companies like UPM are a key part of Carbodeon’s global growth strategy,” says Dr Myllymäki. 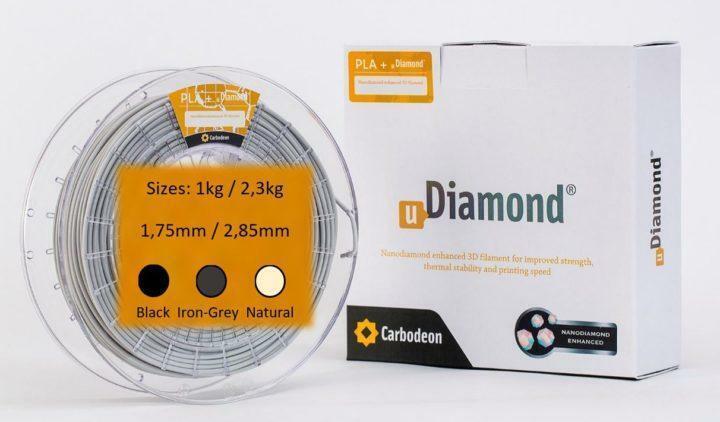 The developed, co-branded PLA compound granule and filament products will be available both from UPM and Carbodeon.